Be a part of Ojai Day 2019! Each year artists compete to be featured on the Herald Printing sponsored Ojai Day poster. In recent years we have been lucky to feature work by Kent Butler, Susan Guy, Jack Davis and Guy Wann. With five stages, there is something for everyone at Ojai Day. Entertainment & Activities for Kids! Each year at Ojai Day there is an entire area in Libbey Park dedicated to kids!! Every year the Ojai community, led by the Ojai Mandala Artists, paint through the night preceding Ojai Day to create a unique mural on the street. Ojai Day is a single day family friendly extravaganza held on the third Saturday in October each year. 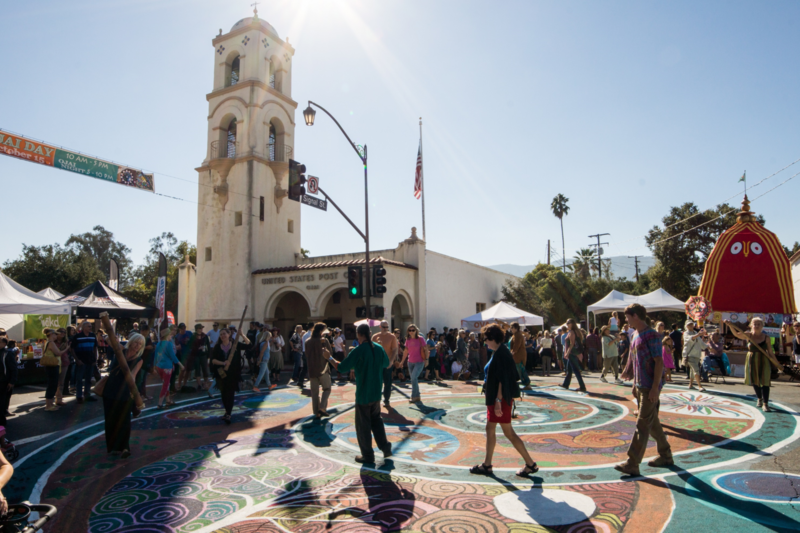 We close Ojai Avenue to cars and fill it with vendors, live music, and fun for young and old.